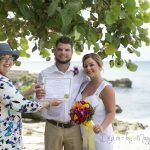 We are just back from Jamaica where I was the co-officiant at the wedding of a relative of ours. 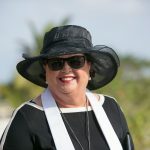 We have been friends with the parents of the bride for over 30 years, so when we were invited to Hotel Riu on the north coast of Jamaica for their daughter's wedding we were happy to join the celebration. Coincidentaly it was also our 37th wedding anniversary so we were in a party mood anyhow. We took Cayman Airways and got to Montego Bay at 9:10am and really only had time to catch-up with the family members and eat some great jerk and curry goat before getting ready for the wedding which was at 2pm. The bride, who comes from the Toronto area, had a jet-ski accident at the resort on Sunday night and fractured her ankle. Despite being between crutches and a wheel chair she still had a great time. 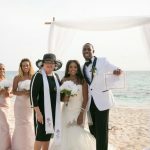 As I am not licensed to perform marriages in Jamaica, the Jamaican Reverend Godfrey did the paper-work right after the ceremony and the Unity Sand Ceremony. He allowed me to do everything including the pronouncement, and I appreciated the fact that he was very gracious and accomodating. 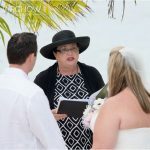 Although I have had requests to do a wedding in other islands, I never pursued it. Who knows what my first Jamaican wedding may lead to. This all-inclusive hotel is very popular for weddings. I liked this little gazebo which is near to the hotel lobby, unfortunately it is not on the beach, but it would be suitable for a more formal wedding.